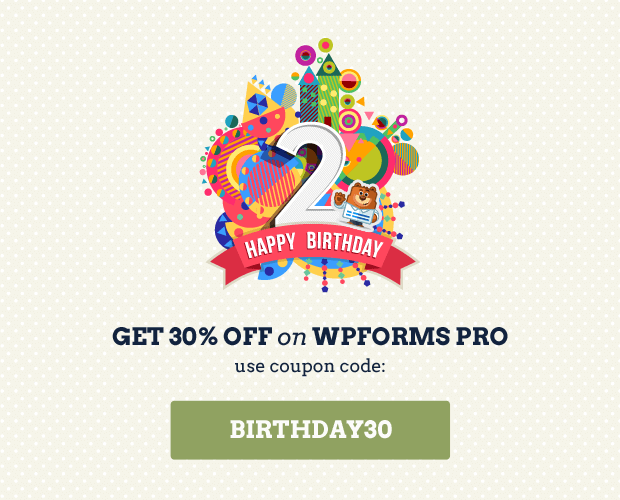 Wow, time is flying fast … I can’t believe that WPForms is already two years old! This past year, we accomplished A LOT, thanks to the hard work of our team and continuous support from our users like you. I wanted to take a few minutes to do a quick recap of all the things that happened this past year and share what’s coming next in WPForms. WPForms has come a long way in the past 12 months. Here are some fun stats to celebrate our second year. We have 900,000+ active websites using WPForms (compared to 80,000 from last year). We have 190+ blog posts (compared to 80 from last year). 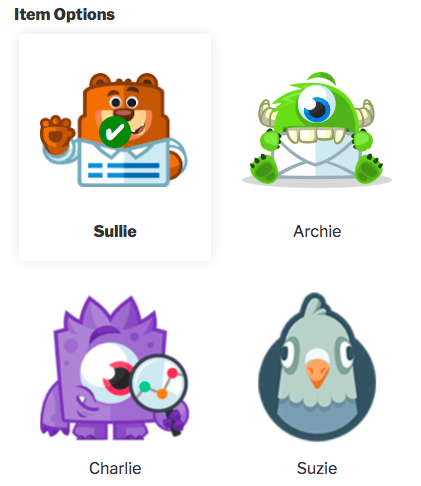 We added a lot of neat features over the last 12 months. Below are some of my favorite WPForms’ features and addons. While surveys was my most favorite feature, multiple choice images was by far one of the most user requested features. Surprisingly enough no other popular WordPress form builder offers this feature without requiring their users to code. Well, we fixed that. Now you can easily add images for your checkbox fields, radio buttons, as well as multiple choice payment fields. Email deliverability has been a well-documented problem for all WordPress websites. As WPForms grew, we became more aware of this painful issue that affected our users and the larger WordPress community. So we acquired the most popular SMTP plugin for WordPress last June and completely revamped it from the grounds up. Since then it has gone from 600,000 active installs to 800,000 active installs. Basically, this plugin routes your emails through popular email services like Gmail, SendGrid, etc instead of your WordPress hosting server which significantly improves deliverability. We started WPForms with a single goal in mind: to make the most beginner friendly WordPress form plugin. As the word spread, more and more people wanted to try the WPForms difference. To make it easy for users to switch and try WPForms, we created a powerful Form Importer tool. This allows you to easily migrate your Contact Form 7 forms to WPForms. We also expanded our form importer, so you can easily switch from Ninja Forms to WPForms. WPForms is used world-wide and sometimes for collecting information in remote-areas where internet connectivity is a big issue. Getting disconnected from the internet when trying to submit a form is enough for most people to give up because it means you have to restart the whole form submission process. With the offline form addon, we created an offline form submission mode which saves the form data in your browser even if you close the tab. Once the internet connection is restored, you can easily restore the information and submit it. WPForms was the first WordPress plugin to offer pre-built form templates and our users loved it. That’s why last year, we added a brand new form templates pack that comes with additional 100+ pre-built form templates to help you save time. When we first launched WPForms, our conditional logic feature also known as smart form logic, was a separate addon available only for our Pro users. Last year, we significantly improved the conditional form logic feature and built it into the WPForms core plugin so more people can use it. We also added new conditional logic features that our users were requesting. I’m proud to say that WPForms offer by far the most comprehensive form logic solution in the market. Creating a multi-column form layout was one of the biggest request that we got when we first launched WPForms. We looked around the market and every WordPress form solution was offering pre-made CSS classes to be used for form layouts. We took it to the next level and made it even easier for beginners by offering visual form layouts, not a CSS class text field. This is one of the most loved features of WPForms. While we started WPForms for beginner users, a lot of developers and agencies have started using and recommending WPForms to their users due to it’s ease of use. To make website development and form creation easy, we introduced a new option to create custom form templates. This allows you to extend our pre-made form templates selection by adding new form templates that you can easily use on your site. WPForms came built-in with reCAPTCHA feature, and last year we extended it to add support for the new invisible reCAPTCHA feature that Google announced. You can easily enable this for your forms inside your form settings. This is just a brief highlight of all the new features that we added. There were tons of additional features to improve entry management, form export, overall UI, and more. First, we’re going to be adding more email marketing integrations. We are starting with the list of most requested integrations that you guys have asked for. We’re working on adding recurring payments functionality for our Stripe addon. We will also be working on several new enhancements and features, updates to the survey addon, and a brand new onboarding flow which I know users will love. We’re always listening to users for ideas and suggestions. If you ever have an idea for a new addon or feature that you’d like to see, please get in touch. Thank you for your support in making WPForms the best WordPress contact form plugin. P.S. Don’t have a WPForms Pro license? Click here to get started today, and experience the WPForms difference. Use the coupon: birthday30 to get 30% off your purchase (limited time offer). Mesmerised with the list of features listed here. Seems WP Form has ability and can change the marketing model in future, as a standalone plugin. Congrats on two great years! I love WPForms. Thanks for all you do! Congrats – you’re doing great work and definitely deserve that amount success! As you’re planning that, it would also be great to see A/B-Testing at a certain point, like in ETs Bloom plugin. Thanks a million an all the best! Congratulations on the two years and for the first class support. So I assume onboarding flow will have the complete workflow management. Thanks Alwardi! I apologize, though, as I’m not sure what you might have in mind for workflow management. When you get a chance, could you please get in touch to let us know more details about what you’d like to see? That way we’ll be able to add those details to our feature requests for consideration. We don’t currently have a way to generate invoices or print labels for form entries, but I agree these would be super useful. I’ve noted this on our feature request list so our team can consider these ideas down the road. Thanks for the suggestions! erst einmal herzlichen Glückwunsch zu zwei Jahren. Ich habe eine Seite für Bewertungen erstellt. Kann ich auch ein Kommentarfeld hinzufügen, so dass Kunden Bewertungen abgeben können, die auf meiner Seite zu lesen sind? Sure, it’s absolutely possible to use our forms to collect reviews on your site. The best way to accomplish this (so that the reviews can easily, or even automatically, be displayed) is to use our Post Submissions addon. Here’s our tutorial with all the details on how you could set this up. The Post Submissions addon is available with our Pro license level or higher.